Special Edition of Whispers . . .
Marylou and I have spent the last week moving to the Sierras of Northern California. 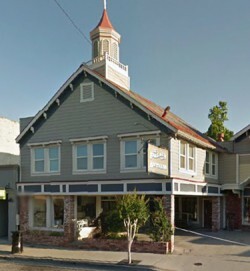 Our beautiful new studio occupies the upstairs at 138 E. Main Street in the Historic Gold Rush Town of Grass Valley California. If you are ever in the area, please drop by and say Hi! Planning is good; obsession over the planning is not. The key to planning is an attitude of flexibility and allowing for plans to change in order to create a better flow. Do not hold on to what does not serve you. It does not matter if busyness and chaos surround you. Keep your focus on the beauty that can be found in each moment, remembering that at times you must look below the surface to see it. All the best to you this day! Don’t Live In The Past Or The Future . . . Your Teachers . . .
Congratulations! Your new studio looks great. Happy adventures and we will talk soon. Awesome move Alan! I hope your new place is amazing! Very good perspective–one I’ll take to heart! Thank you! Thanks Joel . . . hope you are having a magical day!
? It’s beautiful! In any case, congratulations on your move! This is our new studio. I’ll send you a photo of our new “Hippy” home which was built in 1900. Wonderful!!! Thanks! Looking forward to seeing it!!! Welcome to your new home, that is a beautiful part of California… Enjoy the peaceful living up there! WELCOME HOME! I live in GV too … and look forward to visiting and enjoying all the “art” and “words” in real time again! Thanks for the kind words Jennie. The zip code for our studio is 95945. Congratulations! Grass Valley and the surrounding area is fabulous… enjoy!